New York Rangers President and General Manager Glen Sather announced today that goaltender Chad Johnson has been recalled from the Connecticut Whale of the American Hockey League (AHL), while goaltender Cam Talbot has been assigned to Connecticut. Johnson, 24, has posted a 16-19-3 record with a 2.72 goals against average, a .901 save percentage and two shutouts in 40 games with Connecticut this season, including a 13-8-3 mark in his last 24 decisions. He leads the Whale in wins and is tied for the team lead in shutouts, and ranks seventh in the AHL in minutes played (2,271). Goaltender Chad Johnson has five games of NHL experience as a Blueshirt, including his first NHL win over the Avalanche at Denver on Jan. 31, 2010. Johnson has won two of his last four decisions, stopping 43 of 46 shots for a .935 save percentage in those contests. He also recorded a 10-2-2 mark in a 14 game stretch from November 19 at Springfield to January 5 at Worcester, posting a 2.01 goals against average, a .918 save percentage and two shutouts over the span. Last season, Johnson made his NHL debut with the Rangers on December 30, 2009 vs. Philadelphia, entering the contest at the start of the second period and stopping 17 of 20 shots in a no decision. He recorded his first NHL win while starting in consecutive games for the first time in his NHL career, in a 3-1 win at Colorado on January 31, 2010. Johnson also registered an assist in his first career start on January 7, 2010 at Atlanta, becoming the first goalie since Alex Auld on January 23, 2002 to accomplish the feat. The Calgary, Alberta native was acquired by the Rangers on June 27, 2009, from Pittsburgh in exchange for a fifth round draft pick in the 2009 NHL Entry Draft (Andy Bathgate). He was originally selected as Pittsburgh’s fifth round choice, 125th overall, in the 2006 NHL Entry Draft. Talbot, 23, dressed as Henrik Lundqvist’s backup in last night’s contest vs. Buffalo, following his recall from Greenville (ECHL) on Monday. He returns to Connecticut (AHL) where he has posted a record of 8-3-2 with a 2.42 goals against average, a .919 save percentage and two shutouts in 13 games this season. Talbot was 7-1-1 with a 2.40 goals against average, a .916 save percentage and one shutout in nine games prior to suffering an ankle sprain on January 16 vs. Wilkes-Barre/Scranton. Talbot earned his first professional win with a 41-save shutout at Providence in his season debut on October 17. He has also posted a 1-0-1-0 record with a 2.46 goals against average and a .921 save percentage in two appearances with Greenville this season. 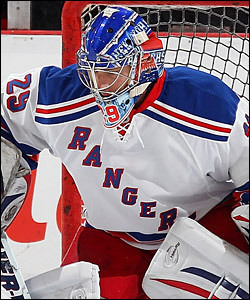 The Caledonia, Ontario native originally signed with the Rangers as a free agent on March 30, 2010.